Manny Pacquiao beat Timothy Bradley on points to win the WBO welterweight title in Las Vegas. Filipino Pacquiao, 35, who lost to American Bradley in a controversial encounter in 2012, was the winner on all three judges' scorecards. "I proved tonight that my journey in boxing will continue," said Pacquiao, who has won 56 of his 63 fights. Bradley, 30, said: "I tried, I really tried. I just lost to the best fighter in the world." Judges Craig Metcalfe and Michael Pernick scored the fight 116-112 for Pacquiao, while Glenn Trowbridge made him a 118-110 winner. Pacquiao has won world titles in eight weight divisions during an illustrious career that began in 1995, but Bradley questioned his hunger in the build-up to their rematch. Asked how much longer he will continue, Pacquiao said: "A couple more years. "There's no problem for me. My job is to fight in the ring - any opponent." Bradley, unbeaten in his previous 31 fights, received hate mail and death threats after claiming a disputed points win over Pacquiao in their first bout. "I thought I had to do more [than the first fight]- that's why I was going for a knockout," Bradley said of his occasional ill-discipline at the MGM Grand on Saturday. "Manny fought his heart out and the better man won tonight. "I was trying to hit him with something over the top when he was throwing. I got beaten here but the war is not over." Pacquiao was more aggressive and accurate from the start of the fight. 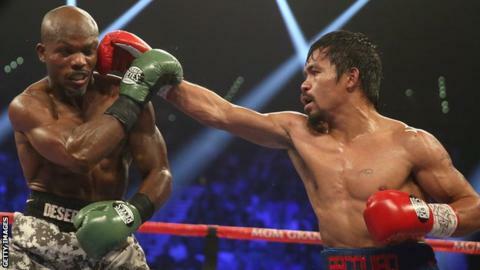 Although they exchanged big shots in the opening rounds, Pacquiao appeared to wear out Bradley with the heavy early pace. Bradley responded impressively in the fourth round, wobbling Pacquiao twice with a right hand, but he was outboxed for the majority of the remaining rounds. "I didn't want to get careless," Pacquiao said. "I picked up more steam in the second half when I made adjustments. "Bradley was much better than in the first fight we had. He hurt me on the chin."